Who Wore it Better? Who Wore it Best?? Kismet: The First Miss Uni-Cat. 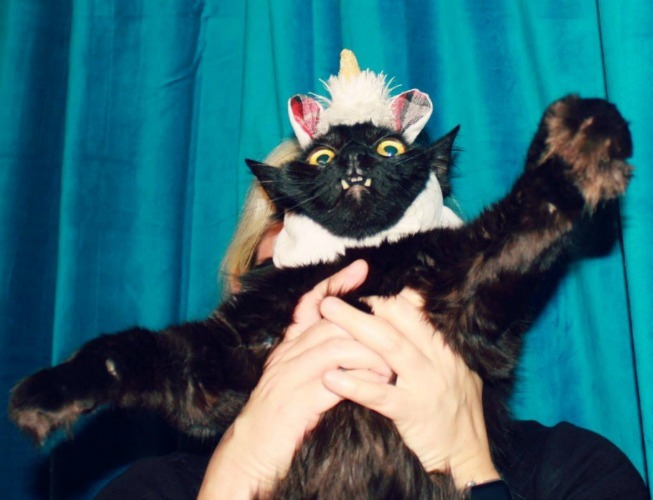 The 2016 Uni-Cat Pageant was a celebration of cats, unicorns, cat head-gear, and even a dog. The pageant began with a single question, posted on the eve of Abraham Lincoln's birthday (2/11/16) - Who wore it better? 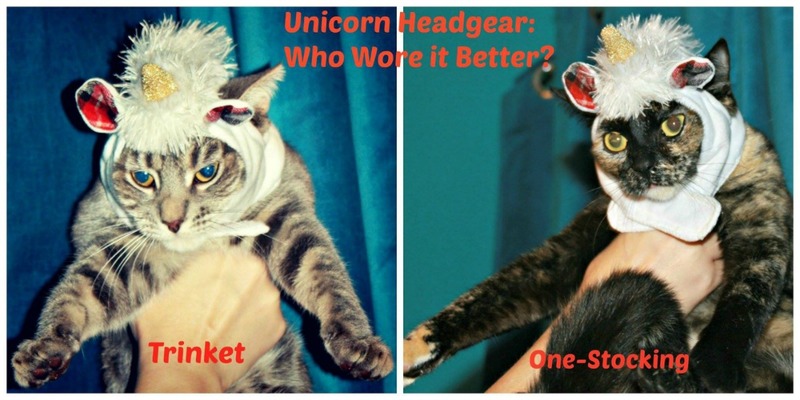 The question was posted on social media along with an image depicting Trinket and One-Stocking from the New Originals, both adorned in adorable unicorn head-gear. As voting commenced and people chose their champions, the passion expressed by the post's commenters suggested this was no frivilous antic. This was a full blown, hotly contested, hard-won competition which would entail the involvement of all the cats at our disposal. Abraham Lincoln never imagined a birthday like this one. How many cats were at our disposal? Seven. A lucky number, but an odd number. We needed at least eight and that's when Beezel Bear, a very enthusiastic and cat-friendly Pomeranian, stepped in and saved the day as our eighth participant. With an even number of participants, we posted additional matches on social media where people voted on who, they thought, wore it better. 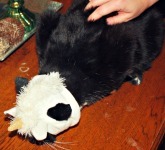 Trinket VS One-Stocking was followed by Furfur VS Kismet, then Pazuzu VS Ava. The fourth round matched Manservant Vexibus against Beezel. The last-minute addition of a dog into the Uni-Cat Pageant only sweetened the pot. Nobody had a problem with it, probably due to Beezel's natural enthusiasm about the project. 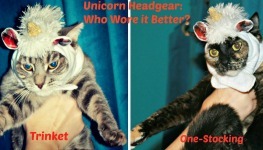 Also, the unicorn headgear fit him just fine. That was really our only concern. After the first round of voting, our pool of contestants was down to four: Trinket VS Kismet and Ava VS Beezel. From the final four, Trinket was defeated by Kismet which says a lot for Kismet's natural cuteness factor. It is not easy for anybody to defeat a new kitten, especially in a cuteness contest. 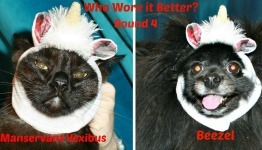 In the fascinating cat VS dog match, Ava was chosen over Beezel by a narrow margin - just one vote. In fact, all of the matches were very close; the winner was frequently determined by just one fickle vote. The event's final match: Ava VS Kismet went live on Presidents Day, February 15, 2016 and it was a clash of two truly photogenic beauties. In the end, Kismet won the day and was hailed by all as the first Miss Uni-Cat. She wore it best of all. 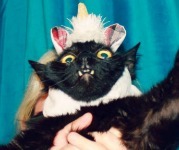 The Miss Uni-Cat Pageant wasn't for everyone. 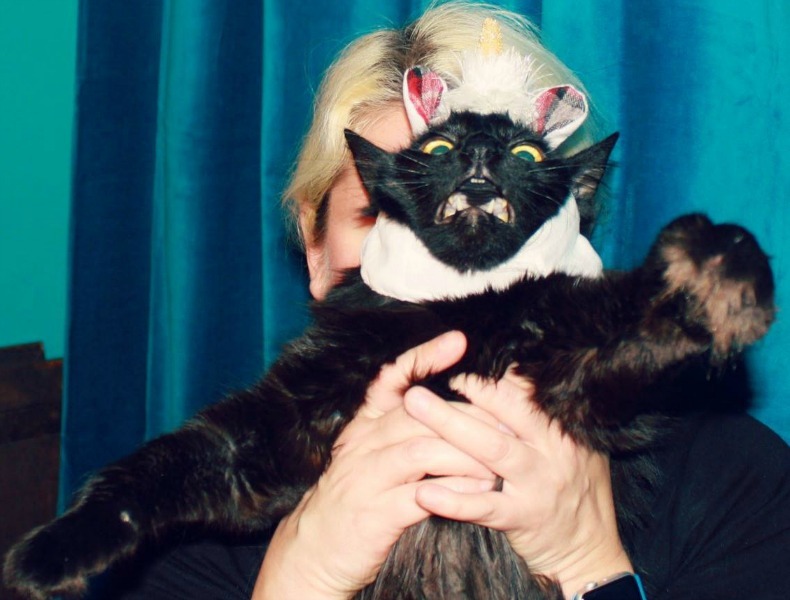 Some All of the cats actually hated it, as revealed in these outtakes. The Furfur outtakes won a fan-base of their own. 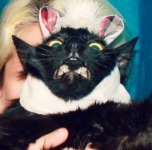 One voter opined that Furfur would have won the pageant if his outtake photos were used in the competition. Maybe, maybe not. Anyway, congratulations to Kizzy!